Summer is almost here and the Village would like to take this opportunity to update our residents with some important events and projects in the Village. Please take a moment to read about Movie Night at Waldmann Memorial Park, taxes, upcoming road work and some additional information. If any resident has additional questions, please contact Tara or Maureen at Village Hall. MOVIE NIGHT AT WALDMANN MEMORIAL PARK: The Village of Munsey Park and the Munsey Park Women’s Club invite you to attend Movie Night at Waldmann Memorial Park on Monday evening, June 25. Bring a blanket, chair and come down to watch the movie GOONIES under the stars. The movie will begin at sundown and popcorn will be served. We look forward to a great evening and this new summer tradition in our Village. All Village residents are welcome to attend. A rain date is scheduled for Wednesday, June 27. TAXES: Village taxes are due no later than July 2nd without penalty. Taxes were mailed out a couple of weeks ago. If you have not received your tax bill in the mail, please call Village Hall. Village taxes reflect no tax increase for the current fiscal year. Any increase from last year is due to the change in the tax assessment rate from Nassau County. We will continue to work to contain our Village budget while improving quality of life in a balanced way. Village hall hours are listed below. ROAD IMPROVEMENT: At a special board meeting conducted on May 22, the Board selected United Paving for the Hawthorne/North Eakins road improvement project. The project will begin within the next week and is expected to last for about 2 weeks. Street access will be limited at this time. Please be careful when driving through this area. All residents directly affected by this project have been notified by the Village, if you any questions please contact Village Hall. REPLACEMENT TREES: As you may have noticed, the Village has planted many new trees around the Village. Approximately 30 new trees will beautify the Village in the coming months. With the hot summer days approaching, we ask residents with these new trees to water them frequently. Our road crew is out everyday watering, but assistance from residents would be extremely helpful to our crew and for the survival of these new trees. MUNSEY PARK EAGLE SCOUTS: On Sunday, June 10th, the Eagle Scout Court of Honor welcomed the following new Eagle Scouts: Matthew J. Palmadessa, Dylan Shelley, Ryan Hughes Watson and William Boutzalis. These young men have impacted their communities directly through various Eagle Scout Projects including the renovation of Waldmann Memorial Park. Please join us in congratulating these outstanding young men for their scouting achievements and dedication to our community. MEMORIAL DAY CEREMONY: Thank you to Munsey Park resident Greg LiCalzi Jr. for leading the Memorial Day ceremony at Waldmann Memorial Park and to Mayor Frank DeMento for reminding us of the sacrifices so many have made for our country. What a special day in our community and a tradition that the Village will continue every year. 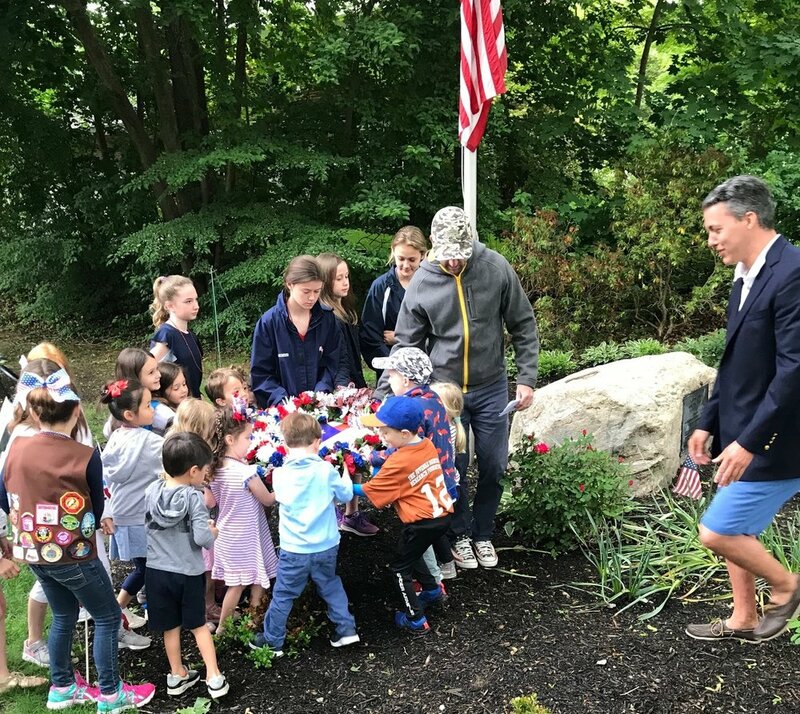 The picture shows the children of Munsey Park placing a wreath in remembrance of our fallen heroes. The flags will remain up on Park Ave until the 4th of July. STREET SWEEPING AND GUTTER CLEANING: The Village is in the process of pumping and cleaning out the Village gutters. Village street sweeping will follow and is scheduled for Wednesday June 27 and Thursday June 28. NATIONAL GRID UPGRADES: National grid has completed the gas line upgrades on Park Avenue and surrounding streets. The final phase of this improvement is to properly patch the road entries, which will begin this week. SAFTEY UPDATE: The end of school is approaching and we ask all residents to SLOW DOWN. Please take your time driving through the Village and be aware of pedestrians and children playing in the neighborhood. Speed control and safety starts with us. SUMMER SCHEDULE: Village Hall will be open Monday through Thursday from 9am - 4pm and close at 12 pm on Fridays through Labor Day. You may contact Village Hall at (516) 365 -7790. NEXT MEETING: Our next meeting will be Wednesday, July 11 at 7:30pm. Just a reminder that there is no board meeting in August, the next meeting following our July meeting will be in September.